Black, Red & Blue. Sold assorted. Imprint Price: Includes all charges for a 1 color set up, typesetting, screens & paper proofs. The mirrors are made from all metal. 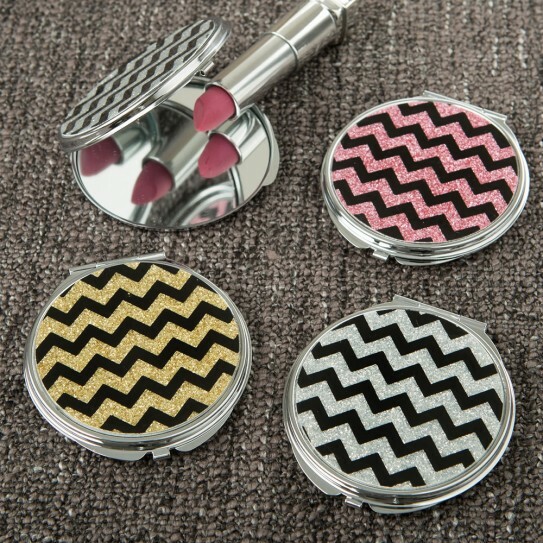 They feature a silver metal outside case and a lid that is beautifully decorated in a chevron design. We offer 3 fabulous colors, silver, gold and blush pink. A shiny bling glitter coating adds a touch of pizazz. The design offers a hinged back and a clasp that opens to reveal a normal mirror on one side and a magnified mirror on the other. 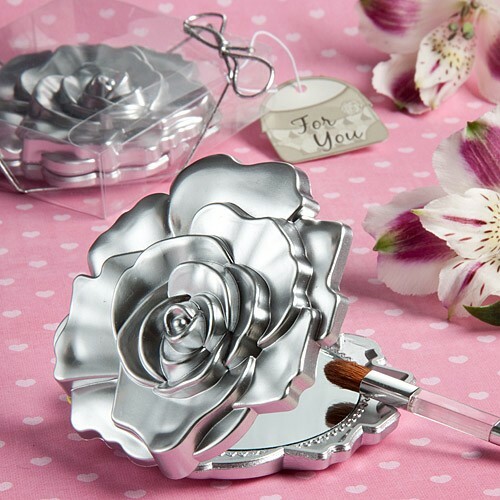 These compact mirrors make classy gifts and fabulous favors for bridal showers, sweet 16's and weddings. Size is 2 5/8" diameter. Glitter finish on lid. Must be purchased in multiples of 18. A beautifully crafted functional fashion accessory! No Imprint Available. Must be purchased in quantities of 18. Sold in assorted colors. 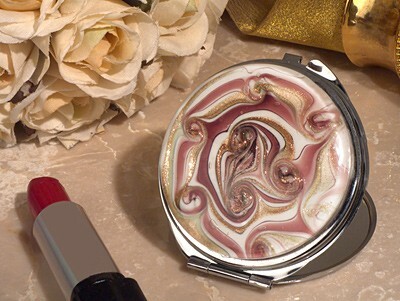 Stylish and elegant, Murano art deco collection compact mirror favors. Inspired by the venetian craftsmen of Murano Italy. These chic and sassy favors are made of a shiny silver metal two piece case accented with a shimmering mauve, gold, and white swirl or silver, burgundy, and white swirl murano like round glass. Every time your guests look into these unique compact mirrors they will be reminded of the fond memories of you special day. They measure 2.6" in diameter and come exquisitely packaged in a silver two piece gift boxed with satin lining and stamped wit our authentic "Murano art deco collection" in silver foil. 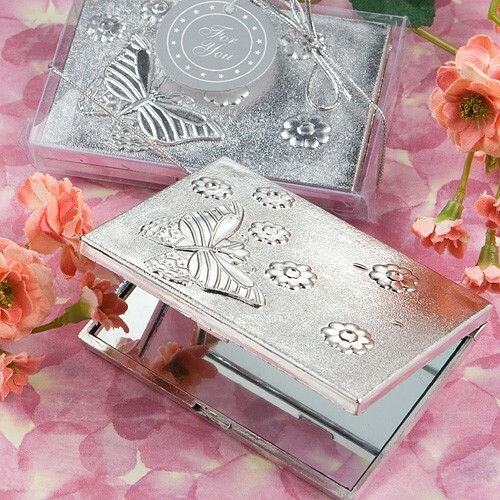 Invite your guests to see just how beautiful they are, inside and out, with these Elegant Reflections Collection butterfly design mirror compact favors. Here's a useful, pretty favor that's guaranteed to bring smiles for years to come. That's because your guests will reflect on your happy day every time they see their reflection in these butterfly mirror compacts. 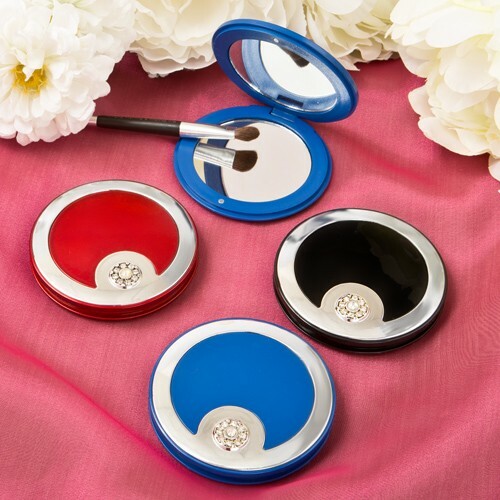 Each measures 3" x 2.25"and is made with a shiny-silver-plated color, hard molded plastic outer compact cover with detailed butterfly and flower designs on top and a hinged opening that reveals a dual-sided mirror interior. Sure to shine as a favor for all occasions, each comes in a clear acetate box, tied with a silver bow and an attached silver "For You' tag. Give your guests a purse for their purse with these fashionable pocketbook-design Elegant Reflections Collection mirror compact favors. Talk about a fashion accessory with style, these purse-inspired mirror compact favors are sure to be the "just-right" added touch for any outfit. And they're useful too! Each measures 3.25" x 2.25" and is made with a shiny silver color, hard molded plastic outer compact cover in an adorable woven-look purse shape with an overlapping hinged snap opening that reveals a dual-sided mirror interior. Guaranteed to be an instant favorite, each comes in a clear acetate box, tied with a silver string and an attached silver letter shaped "For You' tag with heart designs. 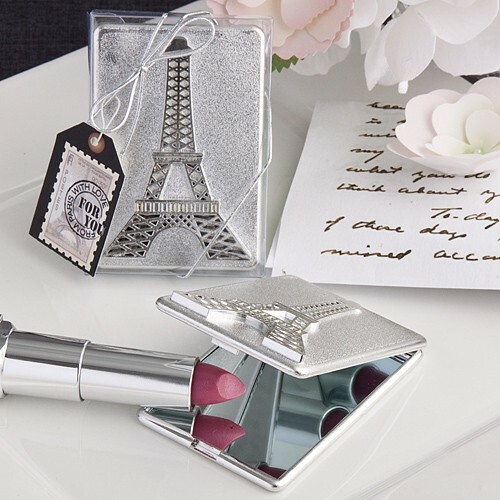 Bring the romance and elegance of Paris within sight with these Eiffel Tower designed mirror compacts. Sometimes glitz, glamor and functionality and more all come together to boost a favor's wow factor through the roof. And that is exactly what happened with this chic Paris themed mirror compact. It's ultra handy and has style galore mixed with Eiffel Tower allure - who could ask for anything more? Description & details - 3" x 2". Rectangular case is crafted in hard molded plastic with a textured shiny silver finish. Raised Eiffel Tower design is detailed and really pops against the texture background. Opens at a top hinge to reveal a dual glass mirror interior. A stylish choice for any special event. Packaged in a clear display box, with a metallic silver ribbon, wrap and bow. Attached is a postage stamp design "For You" tag with a "From Paris With Love" message. 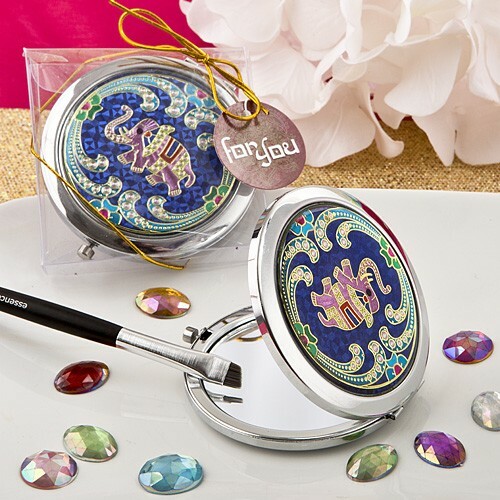 These compact mirrors are made to thrill with a fabulous detailed and colorful Indian theme. The mirrors are crafted from silver metal and feature a bold hot pink elephant on a deep blue and gold background. The elephant wears a blanket, resplendent in gold, red and black. Teal, red and green accents swirl around the borders and into the middle for a perfect finish. The compact opens to reveal a normal mirror on one side and a 2x magnified mirror on the other. An easy-to-use front button clasp and a hinged back allows smooth opening and closing. This good luck elephant compact mirror will add an eastern appeal to a themed event and offer your guests a useful and stylish fashion accessory too. Size of mirror is 2 3/4" diameter. Lid is covered with a clear epoxy dome. Packaged in a clear gift box with gold rope wrap and bow. Indian themed 'For You' card. A great favor for weddings, showers and grand occasions with an eastern style theme. Make sure your event is the 'Best Day Ever' when you give your guests this fabulous favor to remind them of your special day. 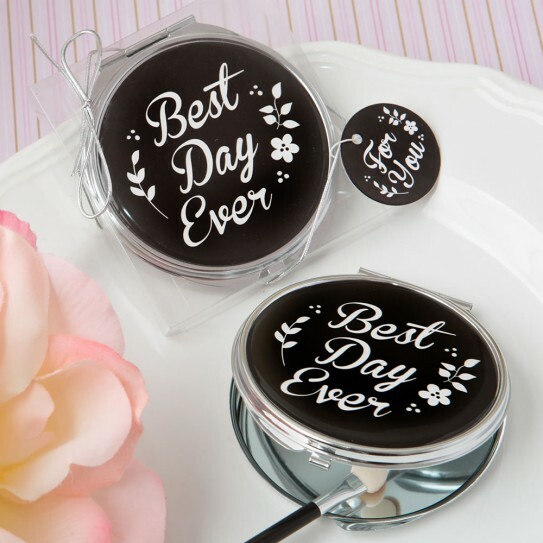 Ever lady loves a compact mirror and one that reminds them of that 'Best Day Ever' is sure to be treasured. 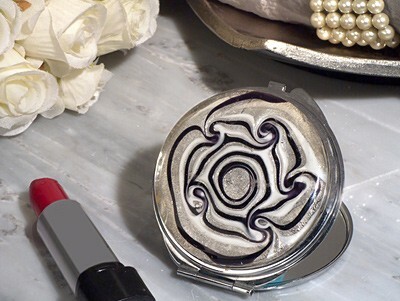 Our compact mirror is made from silver metal with a black epoxy cover. The cover has a fun message in bold white letters with floral accents. It has a hinged opening and a clasp for secure opening and closing. Inside the compact are two glass mirrors, one with 1 x magnification the other with 2x magnification. A fun and useful favor that will get the ladies smiling! Ideal for showers, ladies lunches, sweet 16's other events where the ladies look delightful! Size is 2.5" round. Packaged in a clear display box with silver metallic ribbon wrap and bow. Attached to the ribbon is a round 'For You' tag in a matching black design. A fun and useful favor that will get the ladies smiling, ideal for showers, ladies lunches, sweet 16's other events where the ladies look delightful!